Three generations of the Worst family, from left, Allen, Chris and Ken, are celebrating the business’s 60th anniversary. R.C. 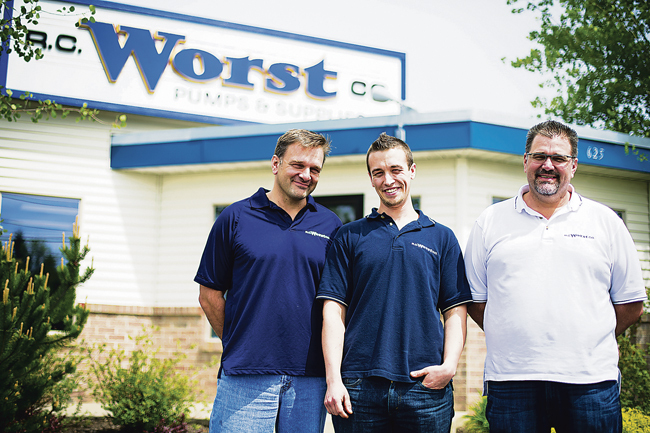 Worst & Company is celebrating 60 years of business in Coeur d’Alene this year. “If R.C. Worst came strolling in here today, I think he would be really proud,” said R.C.’s grandson and part owner of the company, Ken Worst, who is in charge of the company’s accounting and technological development. R.C. survived the Great Depression by fixing cars in Kellogg. Eventually he built himself an automotive business in Hayden. In 1953, R.C. Worst bought Brown Construction from his father-in-law, Fred Brown, and named his business R.C. Worst & Company. In the early 1970s the general contracting business became a regionally reputable distributor of water and wastewater systems. R.C.’s wife of nearly 60 years, Geneva Brown, was the company’s accountant. Together they raised a family and business simultaneously. Today the business is a fourth-generation success with 18 employees as well as a sister store in Spokane. The company is expanding its marketplace by selling its products throughout the Inland Northwest, the U.S., and now Canada. “Our inventory is the largest and most complete in the Inland Northwest,” said Ken Worst on the company’s website, http://www.rcworst.com. Allen Worst, Ken’s brother and grandson to R.C. Worst, is also an owner in the family business whose primary role is sales. “We’d like to continue serving our customers in expanded areas that we see fit, but our goal is not to necessarily have branches all across the country and become the McDonald’s of pumps,” Allen Worst said. Allen and Ken Worst attribute the company’s prosperity to their predecessors. Jim Worst, R.C.’s only son and father to Allen and Ken, started working for the company during his summers in between school years. After completing his engineering and business degrees from the University of Idaho, Jim returned to Coeur d’Alene to his apply his education to the family business. He excelled behind and beyond his desk, with handshakes and with details. “Our values are what have kept us in business so long. We’ve tried to have integrity with dealing with people and be fair with billing so we’re not burning bridges. We’re not willing to take advantage of people,” Allen Worst said. The underpinnings of the business are extremely technical in nature. “We have the knowledge so we don’t guess,” added Allen Worst. In the Worst tradition, a man acts upon his words. Customers come first, business and employees second, owners third. That’s the Worst way.